Dr. Mireya Loza and Dr. Mike Amezcua spoke at UA as part of the guest worker exhibit. From the 2013 Celebrating Excellence | Immigration has been on the minds of many in Alabama since the passage of Alabama’s House Bill 56, regarded as the nation’s strictest anti-illegal immigration legislation.  In the discipline of American studies, however, immigration is an enduring theme and, in the College’s Department of American Studies, Latino immigration and culture is a particular academic strength. Because of that strength, the department and UA became one of only two sites in the Southeast to host “Bittersweet Harvest: The Bracero Program 1942-1964,” which tells the story of the largest guest migrant worker program in U.S. history. In partnership with the Smithsonian’s National Museum of American History and funded by a MetLife Foundation grant, this bilingual exhibit was on display this spring in the Amelia Gayle Gorgas Library. As the exhibit shows, the country’s recent push for anti-illegal immigration laws is not a response to a new phenomenon, but a reaction to an issue at the heart of American society, said Dr. Lynne Adrian, chair of the Department of American Studies. “America is, and always has been, the sum of the tension between its older and newer immigrants,” said writer and labor rights activist Carey McWilliams. Adrian often uses this quote to set the tone in her classes. When McWilliams wrote this as part of the introduction to a 1949 autobiography America Is in the Heart, one of the earliest books about the experiences of the American immigrant and working class, he was referring to the clash of cultures of a post-World War II society. More than 60 years later, his statement remains a telling commentary, Adrian said. The exhibit tells the stories of bracero workers, named for the Spanish term bracero, meaning “strong-arm.” The story of the exhibit’s development is as interesting as the program it depicts. Facing labor shortages on the home front during World War II, the United States initiated a series of agreements with Mexico to recruit workers for American farms and railroads. Enacted in 1943 by President Roosevelt, the Emergency Farm Labor Program, which came to be known as the Bracero Program, brought two million Mexicans to the United States to work on short-term labor contracts. 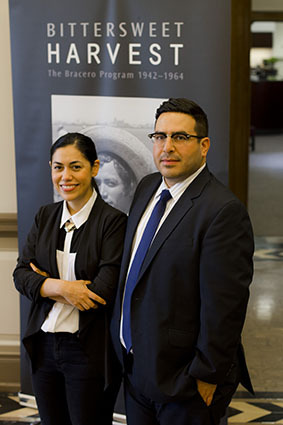 Dr. Mario Sifuentes, an assistant professor of history at the University of California-Merced, collected information for the exhibit during his graduate studies at Brown University by reaching out to communities of former bracero workers. The core of the exhibit is the collection of recordings of the stories of those individuals. The project began in 2002 when historians at the Smithsonian Institute found photos taken by Leonard Nadal. The photos were from the 1950s, but the museum had very little information about their origin or subjects. After consulting with experts in the field, including Sifuentes’s professor, Dr. Matthew Garcia of Brown University, they discovered the photos were taken of bracero workers. Nadal had been hired to document the program by The Fund for the Republic, which published a report exposing its cruel working conditions. Garcia decided to use the photos as a starting point for what would become the ever-expanding bilingual multimedia interactive exhibit of today. To accomplish this, he assembled a group that included Sifuentes; Professor Mireya Loza of the University of Illinois, Champaign-Urbana; and approximately 20 students who traveled in teams to places like Chicago, Ill.; Portland, Ore.; El Paso, Texas; and small communities in California to speak with former braceros and their families. At first, Sifuentes said the team was worried it would be difficult to get braceros to come and speak to them. What happened instead was extraordinary. Over a period of approximately two years, the grass roots project recorded more than 600 interviews with former braceros and their families. Common themes begin to emerge. Sifuentes said that despite the rough working conditions, low pay, and sub-par food and housing, the workers always found a way to maintain a sense of community. The stories are a testament to the enduring nature of the human spirit. But mingled in with these lighthearted moments were stories of exploitation. The farms that hired the workers to thin sugar beets, pick cucumbers and tomatoes, and weed and pick cotton profited immensely at the workers’ expense. The workers came into the country in search of good wages to support their families back in Mexico, but instead they were paid very little and pitted against U.S. farm workers on strike. The selections in the traveling exhibit are just the tip of the iceberg, with a full digital archive available online. Sifuentes said he and his colleagues imagine the project will continue to expand and grow as more former braceros and their families decide to share their stories. For Tuscaloosa and the larger community of Alabamians, the exhibit provides insight into how guest worker programs have both succeeded and failed. According to Innis-Jiménez, Alabama was unusual because it never had braceros. But most would agree that agriculture and the industry’s use of migrant workers is a large part of the state’s economy and its history. For the Department of American Studies, the exhibit is a way to begin a conversation about immigration. They also hope local schools will take advantage of educational materials from the exhibit to continue the conversation. Visit www.braceroarchive.org to see a full project archive.